It's time to start thinking outside the box when it comes to your marketing business. Incorporating full color plastic cards into your overall marketing plan is a perfect way to distinguish your business from the slew of paper marketing materials that flood the market. Plastic cards can be used to fulfill a multitude of different marketing and business objectives, and are perfect for promoting a professional company image. The durability of plastic cards, which is tied to the thickness of the stock, is one of the main reasons that they are so effective. Plastic cards usually range from 12 mil business cards to a heavyweight 30 mil premium plastic card. Personalization - refers to either placing individual's name or photograph on the card. This feature is most commonly used on ID badges or membership cards. Numbering - perfect for membership cards, gift cards, or ID badges, numbering is when each plastic card that is printed has a different number displayed on it. Companies use numbering to track information, or the plastic cards themselves. Signature Panels - most commonly used on the back of credit cards, signature panels often serve as a method of security. The purpose of a signature panel is to provide an area on the plastic that can be written on with a regular pen. Magnetic Strips and Barcodes - often used on credit cards, value cards, key access cards or gift cards. They allow businesses to track, store and change consumer information. A plastic card mailer is a unique and innovative way to promote a company, product or service. 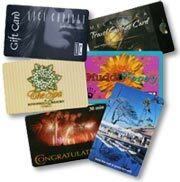 Add high quality, full color printing to the durability of a plastic card and your mailer is sure to stand out among all the other direct mail. Consider including a detachable card to help track your campaign and ensure your marketing message sticks around. The unique design will be sure to grab your prospect's attention and increase your response rate. Need some ideas for mailers? Plastic is perfect for: membership card mailers, product promotions, calendar mailers, service contact mailers, school fundraiser mailers, emergency notification cards, insurance cards, warranty cards, store moving notifications or referral card mailers. You can order plastic cards in two standard sizes - 3 3/8 x 2 1/8 (credit card sized) or 3 ½ x 2 (business card size), or larger 3 x 5 and 4 x 6 sizes. Our cards feature high quality 4 color printing on durable premium heavy weight plastic stock. We can also add any finishing option to meet your needs, including signature panels, magnetic striping, bar coding, lanyard slots and more! Need some design help? Check out our Plastic Card Design and Layout Templates and Instructions for assistance on preparing your file. 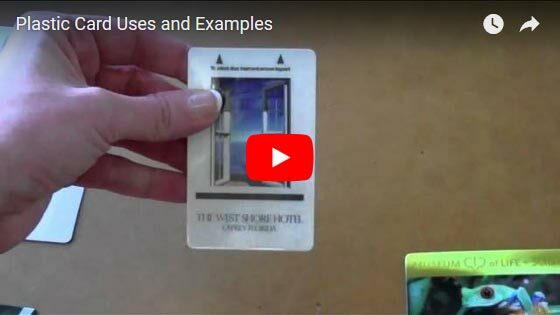 Video showing a variety of creative uses for plastic cards. Need help with your next plastic card project? Give our helpful experts a call at 800-­930-2423, or Request a Quote.